Loreto rises on a hill in a panoramic position near the Adriatic coast and it's a rare case in which a city center it was born around its sanctuary. The history of Loreto is entirely religious and began on December 10th 1294 when from Gerusalemme, in obedience of Angels Comneno's will (principles of Costantinopoli), after three years of trip arrived the Saint House inhabited by Maria and Jesus in Nazaret. Even if the thing seems incredible recent studies on walls and frescoes seem to confirm the authenticity of the relic. The House immediately became place of cult and around to it developed the medieval Loreto: the impressive wall projected by Antonio da Sangallo il Giovane were erected in 1518 and reinforced with four bastions in 1600. The Basilica was begun in 1469 in late-Gothic style on a prooject by Marino di Marco Cedrino and was completed in 1587 with the facade in late-Renaissance style. 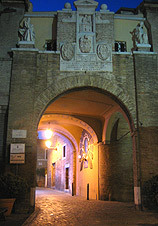 Loreto in the past has been goal of pilgrimage of faithfuls, saints and popes. The visit of the village centers on the Basilica and offers considerable panoramic suggestions and the possibility to admire 8 paintings by the magnificent Venitian painter Lorenzo Lotto, guarded in the municipal museum on the public square of the Sanctuary. 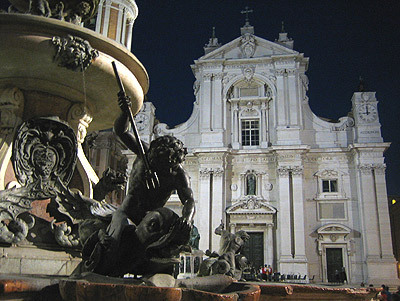 On the same square it's possible to admir the Fontana by Carlo Maderno (1604-1614) and the bell tower (1750-1755, Luigi Vanvitelli).